With Oil Prices Down, Saudi Arabia Turns To The Bond Market For The First Time : The Two-Way Long synonymous with wealth and luxury, the desert kingdom is looking for ways to plug a growing budget deficit. 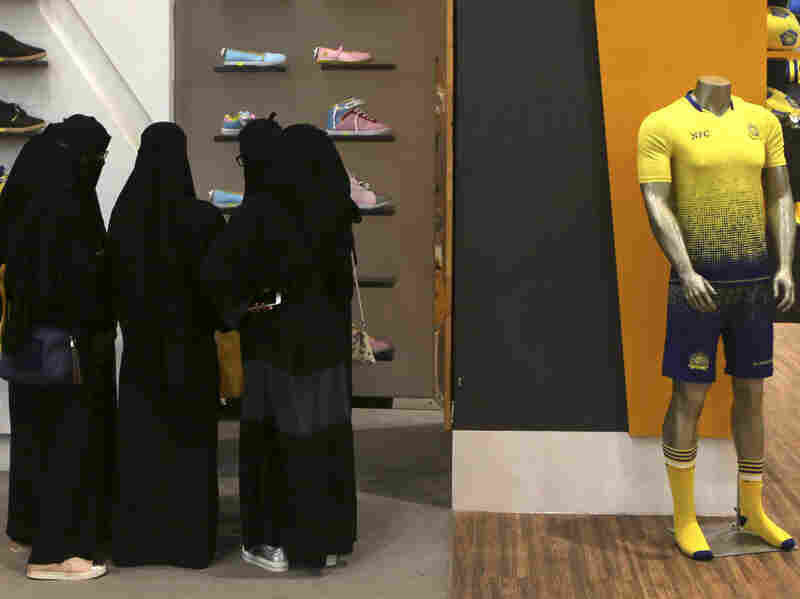 Saudi women shop at a mall in Riyadh last December. With oil prices down, the kingdom is trying hard to reform its economy and attract outside investment. Saudi Arabia has raised more than $17 billion in its first foray into the global bond markets, according to news reports, as the kingdom struggles to close a budget deficit caused by declining oil prices. The sale is the largest-ever bond offering by an emerging-market country, topping Argentina's $16.5 billion offering in August. "Saudi's multi-part debt offering drew heavy investor demand as the world's top oil exporter sought to borrow at historic low yields," Reuters reported. Long an outpost of wealth and privilege, the desert kingdom has seen its economy stall as energy prices have fallen. "The decline in oil prices is expected to dampen growth this year," according to a report from the International Monetary Fund. The country's economy is expected to grow just 1.2 percent this year, compared with 3.5 percent last year. As a result, the fiscal deficit rose to 16 percent of GDP last year, the IMF said. The kingdom has been forced to cut spending and implement fundamental shifts in its economic policies to encourage growth not related to oil. Among other things, Saudi Arabia plans the largest initial public offering in history with the sale of the state oil company, Saudi Aramco, and also is taking steps to open the Tadawul Stock Exchange to foreign investors. "They want to really transform the economy because they realize that given how young the population is, they would need to transform away from oil anyway. There's a lot to do and the question is how forcefully can they implement this program." Meanwhile, oil prices have recovered somewhat but remain well below where they were two years ago. "A gradual increase in oil prices is expected in the next few years, but prices are not expected to recover to the levels seen in the first half of 2014. "Investment in the global oil industry is falling and together with demand growth this should support firmer prices going forward, although [oil] stocks are high and will take some time to clear."